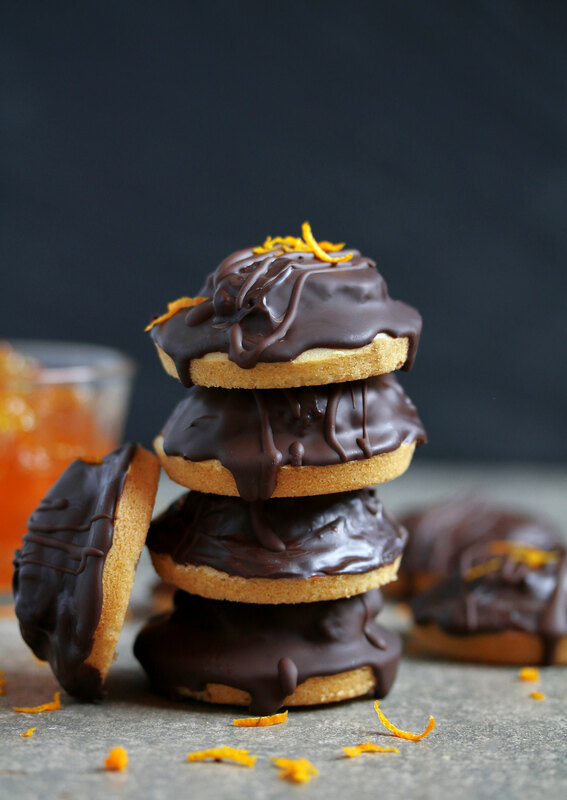 Jaffa cakes are one of those treats that I missed the most since I started avoiding dairy and gluten. Once a Jaffa Cake pack was opened, there was no stopping me. I would gobble the lot! They’re such a comforting snack, especially with a nice warm cup of tea. What makes them even more special is that all Jaffa Cakes are produced at a McVitie’s factory in Stockport, which is not too far away from where I live and around the corner from my parent’s house! I posted a shot of these vegan & gluten-free Jaffa Cakes on my Instagram feed mentioning that I wasn’t sure whether they were only available and sold here in the UK. Many of you informed me that the magic that is Jaffa Cakes have crossed the pond and made their way to different countries around the world like Greece, Germany, Poland, Australia, France…the list goes on! Some of you told me that you have something similar under a different name (Pim’s biscuits?). Apparently in some places like Portugal you can also get raspberry flavour (OMG!) I would definitely love to try one of those! So it’s safe to say that the phenomena that is a Jaffa Cake has made its way around the world and straight into many of your hearts. I guess it would have been selfish for us here in the UK to keep it to ourselves. Sharing is caring, right? 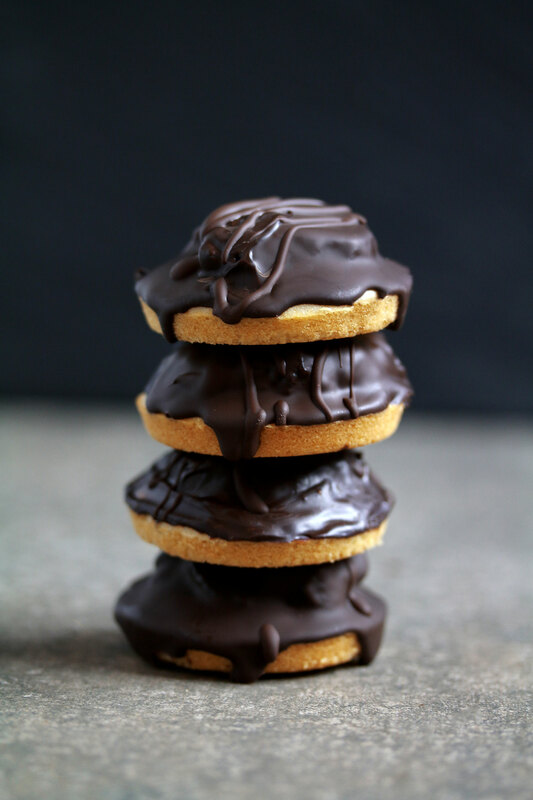 In case you don’t know what a Jaffa Cake is – it’s a small cake that’s shaped like a biscuit (cookie). Made up of a sponge layer, an orange jelly filling, and chocolate topping. Some still debate whether they should be classed as a biscuit or a mini cake. I think the name gives it away, and the texture is definitely more like cake than biscuit. The only thing about it that resembles a biscuit is the size, shape and the fact that they come in a packs just like biscuits. Oh and they’re usually sold in the biscuit aisle which adds to the confusion. 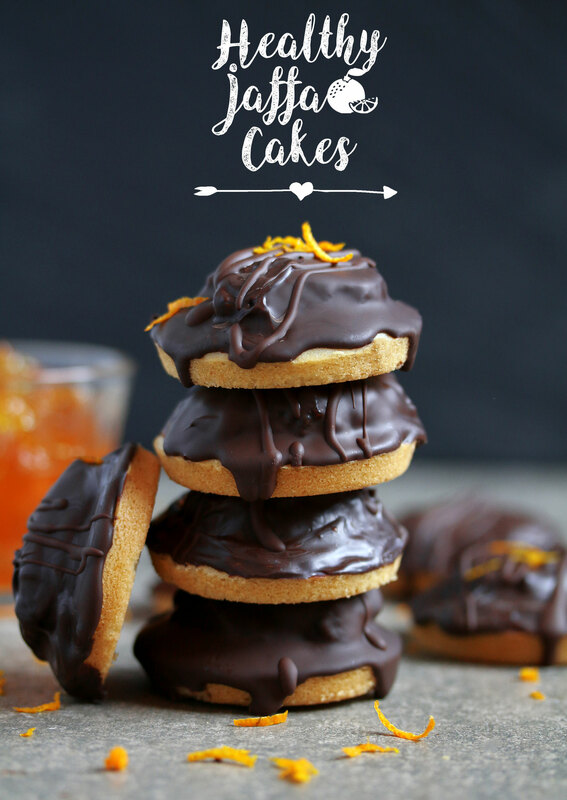 Regardless of whether you think it’s a biscuit or a cake, something that we can all agree on is that Jaffa Cakes are delicious! 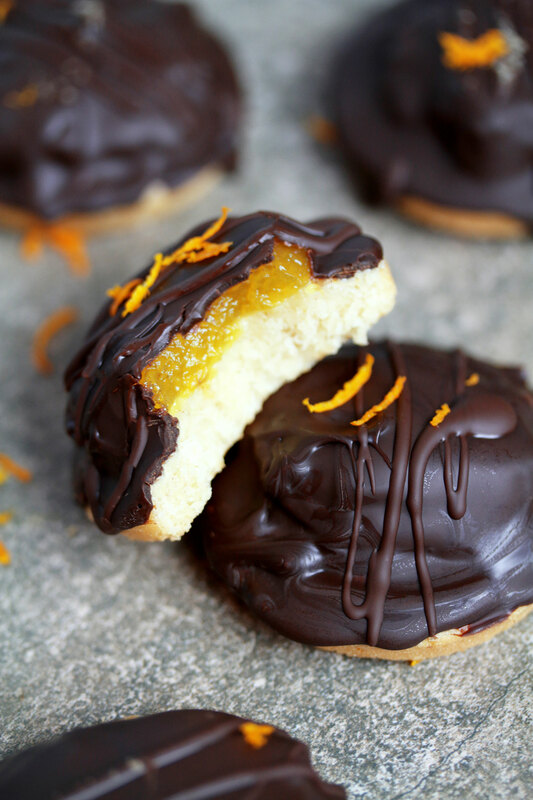 I had to play around with this vegan & gluten-free Jaffa Cake recipe a few times before I was happy with it. First I couldn’t get the texture of the base right, once I did I then had to figure out the best way to make the orange centre. I also wanted to find alternatives to make them as easy as possible to make! So I came up with a simple gluten-free, vegan base of gluten-free flour, ground almonds, coconut oil, milk and maple syrup. For the middle layer, I played around with a jelly recipe a couple of times and I’m pleased with the results! I also tried using shop bought marmalade to make the recipe easier with less steps to follow, and that worked also. 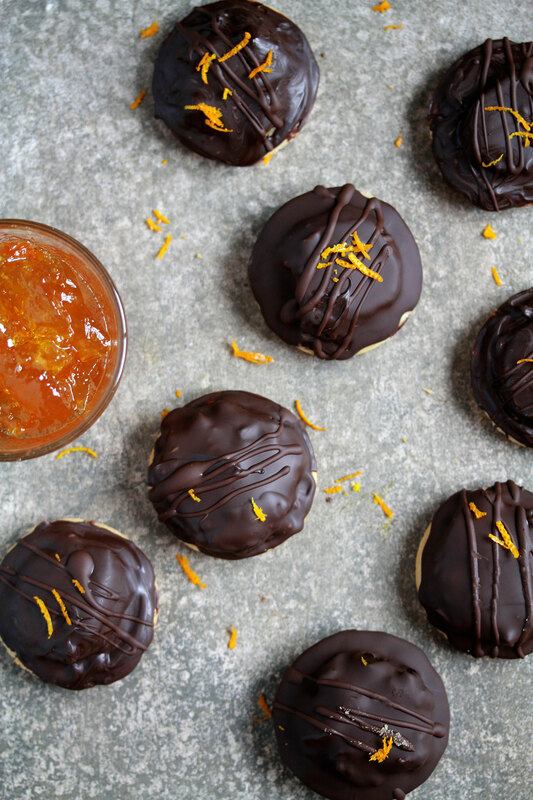 I think using the orange jelly make these Jaffa Cakes taste more like the original, but the hubby thought using the marmalade tasted better. If you can make both, I would love to know which version you thought worked best! Add all the jelly ingredients into a small saucepan and cook on a medium/high heat mixing continuously until it starts to boil. Take off the heat, pour into a wide bowl and leave to cool. Once the jelly has cooled down, transfer into the fridge to speed up the setting process. Cut out rings from the jelly, smaller than the width of the base. Top each base with a jelly ring (or a small tsp of marmalade if you don’t want to make the jelly), then drizzle some melted chocolate on top. I find if u leave the chocolate to cool once melted it’s a lot easier to control drizzling the chocolate on top. Store in an air tight container at room temperature for 3 days. These look and sound so delicious! I’ve never had a Jaffa Cake before and I think I’ve been missing out. Thanks for turning me on to something new and making them gluten-free and dairy-free friendly! When you say gluten free flour do you mean standard plain flour? Omg Nadia you are a genius! I love Jaffa Cakes and there is no stopping me if I start eating them. This is something I definitely want to make at home, it doesn’t look too difficult in your video. Which dark chocolate do you use, which brand? I don’t have a muffin tray but I would buy it, just to make this recipe! Yum! We made some of these a while back as they are everywhere on Pinterest. I much prefer them to “real” Jaffa cakes, as you can pile them high. Omg these look incredibly delicious. Never heard about Jaffa cakes before. Can’t wait to try them . Pinning further. 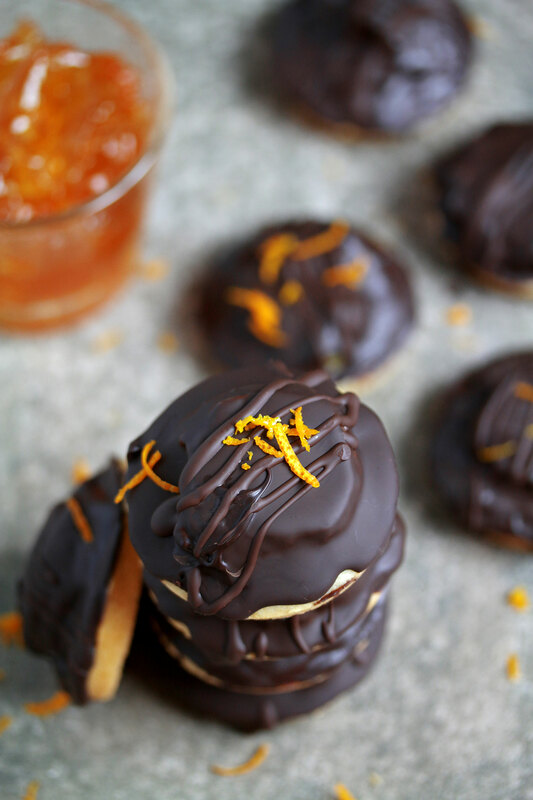 Oooh I now have to make Jaffa cakes – love your recipe and photos! Gluten free flours have ABSOLUTELY no gluten in them. Very different to plain white wheat flour…..different chemistry and different results. Do you think Teff flour would work? These look amazing! My youngest has a nut allergy… Is there something you would recommend as a replacement for the ground almonds? I can’t remember the last time I had Jaffa cakes! I love them but find them a bit too sweet sometimes. I want to try the recipe but I’m afraid I will just end up eating the whole batch lol. Is there any alternatives to ground almonds? I made these yesterday and we tasted them today… I really like the orange jelly, it was perfect. And my son who desn’t like orange and was helping me, had a briliant idea! Agar flakes or agar powder?